I spotted a post on the Skyline Owners Forum for a GT-R spoiler for sale. Oh my... Can it be? 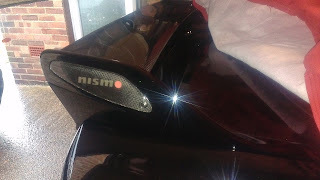 Yes it is, genuine NISMO end caps for the GT-R spoiler! Way back when I first got hold of my GT-R spoiler it came with GT-R end caps, (which I peeled off and sold to help fund the spoiler). At that time I wanted to change to a set of NISMO branded ones but they had been out of production for ages at that point. After much searching I had to settle for an unbranded Carbon Fibre end cap. This was okay (I suppose) although it was not as good a cover as the plastic GT-R one that it replaced (Chinese junk (and I don't mean a boat)). So back to the forum... The deal was done and another spoiler was acquired at a bargain basement price. A quick assault with a hair dryer soon loosened my prize bits of carbon and they easily came away. I then cleaned the backs with some sticky remover and replaced with double sided tape from eBay.. Talk about strong tape, this stuff could hold up shelves! 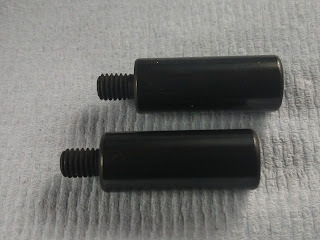 The end caps were sprayed black, dried and covers glued firmly into place. Pleased to fly the flag! Now all I have to decide is if I should keep the GT-R spoiler as a spare or sell it on for a quick profit!